The Hamilton-Wenham Regional School community strives to create a passion for learning in a reflective environment that promotes respect, individuality, and quality achievement. It is our intent to stress a high level of academic achievement for all students. We will continue to develop programs and a schedule to meet the needs of students who will be going on to college as well as to the world of work. Our goal is to provide a meaningful educational experience for every student. Computer education is part of several departments. AP Computer Science - This course is the equivalent of a one-semester course in computer science at the college level. The focus of the course is on computer programming using the Java programming language, a modern, object-oriented programming language that uses the same core syntax as C++, and creates programs that run on Windows, Linux and the Mac. CAD - This course is available to freshmen through seniors. The course is an introduction to the fundamentals of Computer Aided Drafting (CAD). Students will use the engineering software SolidWorks to learn the fundamentals of operating a CAD system. Students will also practice sketching, design and build solutions to several problems and complete a practical application CAD project. This is a Tech Prep class. Modular Technology - The module is a space equipped with materials, tools, equipment, and hands-on activities. Students will work with computers and related equipment to explore the technologies of electronics, robotics, gas engines, Lego/logo, computer aided drafting, engineering, laser/fiber optics, drafting, transportation, and aerospace. The Diversified Learning Program provides students with an opportunity to expand their learning beyond the four walls of a traditional classroom. Students should have earned the necessary amount of credits and demonstrated the academic, behavioral, and attendance success that will allow them to take full advantage of these programs. Learning opportunities could include college level coursework, community service, independent study, internships, long-distance learning and student tutor programs. Each course runs for a semester, but you will have the opportunity to work with the same supervisor all year long. You must be a responsible and independent student, dedicated to your service and willing to follow through on your commitment for the entire semester. Grading: This course is graded on a Pass/ Fail basis. In order to receive a Pass, you must complete the following requirements and abide by the DL expectations. I will provide the forms you will need to properly complete the assignments described below. Each week you will complete a weekly assignment and put it in the DL box outside of room 100 by Friday at 2:30. During Progress Report week you will have your DL supervisor fill out the DL Progress Report and you will put it in the DL box outside of room 100 by Friday October 8th at 2:30. Complete one electronic L.E.A.R.N. reflection by Friday October 22nd. The reflection should be about the experiences you have had thus far during your DL program. A piece of evidence must be part of your reflection. The piece of evidence will be a cover page for your DL notebook that you will create. Specific instructions for this assignment will be provided when the due date approaches. Complete a typed Summary and put it in the DL box outside of room 100 by Tuesday January 18th (the first day of exams) at 2:30. In addition, write a hand-written thank you note to your DL supervisor. Specific instructions for this assignment will be provided when the due date approaches. All DL students (including interns) must report to homeroom for attendance and announcements. If you are absent you must call or email your DL supervisor and let he or she know that you will be absent. Your parent must also call the school nurse as stated in the high school handbook on page 28. DL students must park in their designated spots at all times. All DL students are expected to arrive to class on time. All DL students are expected to have a DL 3-ring notebook that includes all the materials passed out and completed for the class. Each page will have a page number on it. Do NOT email homework to me. All assignments should be put it in the DL box outside of room 100. All DL students are expected to check his/her email every few days for DL assignments, etc. If your DL requires you to leave the High School you must complete the DL Travel Permission slip form. If your DL requires you to leave the High School you must go to the front office and register in the DL Log Book each day. The English Department strives to foster the understanding and appreciation of language, literature and writing. English courses are intended to sharpen critical thinking and reading skills and to develop a more creative and sophisticated writing style. Students who read, write, listen and speak well will be able to comprehend others and to achieve greater self-understanding and self-expression. Since the learning process extends across all disciplines, the critical thinking, reading and writing skills honed in English are applicable in all other subjects. With the ability to express themselves clearly and effectively, students will maximize their academic, civic and social potentials. The mission of the Fine Arts program at Hamilton-Wenham Regional Middle/High School is to provide opportunities for each student to grow through the arts. The Fine Arts Department will provide equitable, comprehensive and sequential opportunities in the arts in an environment where collaborative experiences take place. Fine Arts courses are designed to foster student exploration, expression, interaction, and understanding. The program seeks to help students understand themselves as part of a community wherein artistic expression is evolving. Teachers challenge students to achieve at their highest level possible by addressing multiple learning styles through varied instruction. These artistically rigorous courses ensure that students can achieve beyond their own expectations. Through artistic exploration, students learn to understand the task of caring for oneself and others. They learn the value of reflection, commitment, persistence, curiosity, and self- discipline, while pursuing a life-long relationship with diverse thoughts and practices. The Fine Arts Department encompasses four artistic areas; The Dramatic Arts, The Performing Arts, The Visual Arts and New Media. The elective courses are recommended for all students and are designed to allow students to explore a variety of avenues for effective self-expression. The courses offer opportunities for students to gain the essential skills and knowledge that will allow them to participate in or interact with the arts throughout their lives. Research and decision making assignments prepare students as lifelong learners. Students engage in audio-visual presentations, oral reports and seminars, and write essays and research papers to improve oral and written communication. Courses provide essential knowledge of history and the contemporary world as well as reading, writing and interpretive skills for citizenship. Students study topics from a variety of perspectives to build respect for others. Students are required to go beyond the classroom in their research. Decision making problems, along with knowledge of civic rights and responsibilities, encourage active participation as citizens. To provide all students with the mathematical, statistical and associated technology tools needed for success in the workforce, at college and in the increasingly complex modern world. To work with other departments at the school in the development of cross-curricular projects and assessments that use mathematics in the analysis and explanation of real-world phenomena, especially in the fields of Science, Engineering and Social Science. To help all students comprehend the beauty and poetry inherent in mathematics, and to realize their full potential as mathematicians. The math curriculum is grounded in the school’s mission and expectations for student learning, and has been constructed around Massachusetts and national Common Core standards. Students are required to complete 4 credits in Mathematics. A student who has not completed Algebra I successfully within the Hamilton-Wenham School District will be required to show adequate understanding of algebra concepts and algorithms prior to enrolling in a geometry course. Prerequisites must be met prior to taking a course. The mission of the Science and Engineering Technology department is to instill in our students a curiosity in our natural and physical world and to understand connections between the two. The department courses will allow students to evaluate, process, and acquire essential knowledge in order to become responsible, globally aware individuals and to provide a lifelong positive impact on humanity as citizens and as consumers. All students can learn a foreign language. The ability to understand, speak and write, in the target language is the goal. This is known as proficiency. Skill development is wedded to the need to understand the foreign culture in order to ensure communication. A better understanding of English and our own culture is a byproduct of foreign language study. A student whose proficiency is in the unsatisfactory range must either retake the course with the new grade replacing the former grade on the transcript or take the appropriate course at a lower level. If you are an incoming student, new to the Hamilton-Wenham community please take the Spanish placement test to help us determine your placement. Students will need to go to the link below and take the placement test. You will have up to one hour to take this test and it should be completed WITHOUT using any outside resources. You may also call extension 4410 (internal) or 978.468.0410 from the outside. 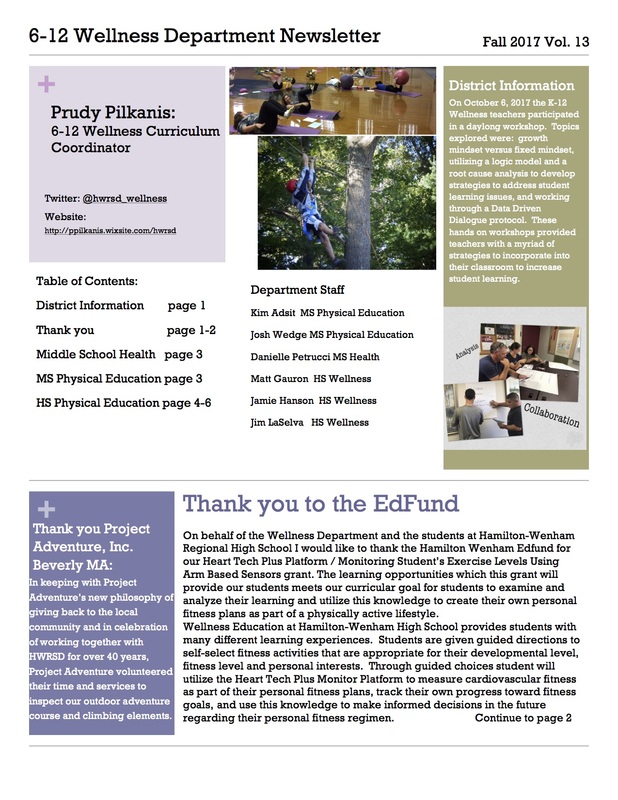 Wellness Education at the high school is a two-fold program: Physical Education and Health and meets the Massachusetts and National Physical Education and Health Standards. The courses provide students with a physically, socially and emotionally safe environment that challenges all learners, promotes the value of a healthy and active lifestyle while providing all students with opportunities for a meaningful and productive learning environment. Students are given the responsibility for their learning and that of their peers through experiences that build on analysis and reflection. This daily connection to decision-making skills, health-related fitness concepts, skill-related fitness concepts and the utilization of life skills is an intricate part of the curriculum and one students will utilize throughout their lives. Through guided discovery and exploration students develop an understanding of interpersonal relationships, decision-making skills, nutrition, digital citizenship, sexuality, substance abuse, and emotional health. Grade 9 - Health and Wellness - One Semester: Students enrolled in this course will learn how exercise affects and interacts with the human body to improve personal wellness. Students will combine regular physical activity in class with health topics to make a life-long impact on their own personal health. In the health portion of class students will analyze the influences of peers, culture, media and technology on health risk behaviors: emotional health (stress, depression, suicide), sexuality, and interpersonal relationships. Learning experiences in both the health and the physical education curricula of the course will provide students with opportunities to increase fitness and wellness to promote overall health literacy. Grade 10 - Adventure Leadership Education 1 - One Semester: The Adventure/Leadership Education 1 curriculum provides essential knowledge and skills for students to become critical thinkers and creative solution makers. Opportunities in leadership, teamwork and self-esteem are developed through experiential-based learning in problem solving and community building. Learning experiences include non-competitive games, initiatives and climbing challenges on our ropes course. These elements help groups explore communication issues and skills, problem solving techniques, dependence on others, patience, goals, and trust while developing 21st century leadership skills. Students will analyze the influences society, culture, media, and technology have on substance abuse. They will explore preventative strategies, practice and apply decision-making, problem-solving and refusal skills to promote healthy behaviors. Electives: **Electives are open to all students as additional Wellness class offerings. These electives will provide students with the opportunity to select their Wellness experience. Each of the courses will contain health-related lessons with both long and short-term projects/activities, which will engage students in dealing with numerous health risk factors. Yoga/Pilates: This class is designed for the student who strives to adopt and maintain a healthy lifestyle. The course introduces students safely to Yoga and Pilates. In Yoga students will learn basic yoga postures, breathing techniques and relaxation methods. In Pilates students will learn about guiding principals of Pilates, build core strength, focusing on proper alignment and training the body as a whole. Students will learn modification of exercises and postures and how to tailor workouts to their individual needs. Students will have opportunities to create their own individual Yoga/Pilates routines to utilize during class. Both long and short-term projects/activities will engage students in dealing with numerous health risk factors. Fitness Training: This class will help students develop their level of physical fitness while participating in a variety of activities and wellness opportunities that will be carried over to adult life. Students will learn how to develop a weight-training program designed around their own needs, goals, and strengths. Students will assess their fitness levels and learn to develop their own fitness routines in order to meet their goals. Activities include: flexibility training, weight training, plyometric training, cardiorespiratory training, balance training, speed and agility training, and core strengthening. Both long and short-term projects/activities will engage students in dealing with numerous health risk factors. Lifetime Activities/Competitive Games: This class is for students who enjoy participating in individual and team sports. Students will develop proper techniques and skills associated with a variety of sports as well as focusing on team play, strategy and sportsmanship. They will also participate in cardiovascular, strength and agility training activities. Students will be provided with the ability to select and design a personal fitness plan. They will be responsible for setting and measuring their goals and reflecting upon their fitness development. Some of the activities included are: ultimate frisbee, flag football, soccer, net games and basketball. Both long and short-term projects/activities will engage students in learning about numerous health risk factors.